"Seldom visible in the Yemeni mountains, the elite U.S. commandos training the Yemen’s military represent the Obama administration’s quest to fight terrorism without inflaming anti-American sentiment. That balancing act has become an administration trademark, funneling millions of dollars in aid and low-profile military trainers to countries such as Pakistan and Yemen in order to take on a more diverse, independent and scattered al Qaeda network. The scope and amount of the military training in Yemen has grown slowly, reflecting the Pentagon’s intention to tackle the terrorism threat while still being sensitive to fears that a larger U.S. footprint in Yemen could help fuel the insurgency." US airstrikes against ISIS in Iraq, far from “degrading” the organization, are actually giving ISIS a huge shot in the arm, according to FBI Director James Comey, who testified today before Congress. The US operation seems to be playing directly into ISIS’ hands in many ways, with President Obama’s high-profile speech last Wednesday, promising to escalate the war on ISIS into neighboring Syria, paying off for ISIS in recruitment as well. "There is of course a reason why Barnard is lying about the Syrian air-force attacks on ISIS. Those attacks have indeed intensified and have become much more precise. During the last months Russia delivered new Yak-130 training jets to Syria which are modified to enable ground attacks. The Syrian air-force MIG and Suchoi jets were update too and are now much more capable of precise targeting. The Syrian air-force is by now said to fly more than 100 sorties per day. These new capabilities make it, of course, completely unnecessary for U.S. planes to attack ISIS targets in Syria. The Syrian air-force is quite capable of doing that on its own. Where it could need additional help is in intelligence on ISIS targets. 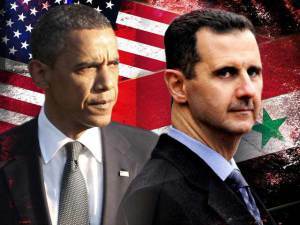 But the U.S. aim is "regime change" in Syria by whatever means and with total disregard of the consequences. Admitting that the Syrian air-force is capable and willing to attack ISIS would take away the pretense for those U.S. air strikes that are meant to destroy the Syrian government and to achieve "regime change"."